Claytile, one of the Western Cape’s respected clay brick manufacturers is supplying over a million bricks to Hotel Verde, cited as Africa’s Greenest hotel. This 45 room hotel is pursuing green certification through a stringent programme called ‘Leadership in Energy and Environmental Design’, spearheaded by the US Green Building Council. Claytile secured the order for 1,2 million clay bricks from Stefanutti Stocks Building Western Cape, based on their 10,84% Post Consumer Recycled content. The focus throughout the Hotel Verde construction project has been on sustainable construction and operational practices. The Hotel Verde have considered every aspect of environmental awareness and energy efficiency from locally sourced suppliers to sustainable practices on the building site. 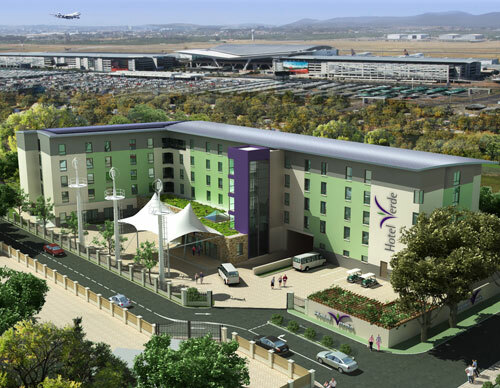 Hotel Verde will open to the public in May 2013, and will offer guests incentives to save energy and water, such as credit notes and bar tabs for those who use towels more than once or don’t use the air-conditioning. Sustainable practices extend to hotel operations and will include community involvement and social upliftment schemes. Hotel Verde will generate an estimated 103 direct jobs and a further 247 indirect jobs. Laundry dryers will use excess heat from the building to dry linen and table cloths via heat pumps. The north-facing roof will be covered with solar panels, helping to generate a power for the hotel’s battery banks. The lifts will run on a regenerative drive, which will allow for about 30% of the input energy to be recaptured and fed back into the building. Double-glazed windows with spectrally selective glass will filter out hot rays, so less heat enters the building and reduces the need for air-conditioning. The swimming pool will be heated by excess heat from the ventilation and air conditioning system. Three vertical axis wind turbines, contributing to on-site generated renewable energy, will be installed on masts in the parking area in front of the main entrance. The tip of the wind turbine will be at 17m where the wind speed is optimal, to maximize output. Occupancy sensors monitor certain areas, like passages, offices, storerooms, toilets, etc. and switch off lights if no-one is present, thus reducing energy wastage.